Welcome to Day 10 of 30 Days to a Food Revolution. 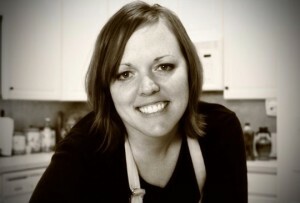 Our guest blogger today is Sara from The Messy Chef. Sara and her husband used to lead “normal” lives – lives filled with sickness, disease, pain, obesity, and exhaustion. You name it, they experienced it. A miscarriage for Sara and a cancer diagnosis for herhusband gave them the wakeup call they needed and they decided to do something about it. They changed their diet dramatically and removed all of the chemically engineered “food” and Sara gave herself a challenge. Instead of getting depressed about not being able to cook and eat the foods they were used to, she decided to create all of the foods that they loved in a new and healthy way. And now the disease and sickness are gone and they both feel great. Her blog, The Messy Chef, was created for all the messy chefs out there who want to cook healthy but are afraid or just don’t know how. It’s for people who are sick of being sick. It’s for people who have been on diet after diet after diet and continually fail. This way of cooking and eating isn’t a diet, it’s truly a lifestyle. Healthy is NOT low or no fat and tasteless. Healthy is delicious and Messy is the new black! When I first heard about this 30-day project, I was so excited. I’m extremely honored to have been asked to participate. 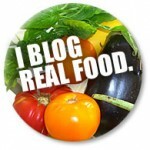 As a relatively new food blogger, I’m constantly amazed at the talent of all the other bloggers out there. I’m also touched that their stories are so close to my own. Why is it that healthy cooking (and eating) is almost like a disease in the world we live in? You mention to people the kind of lifestyle you lead by eating a lot of vegan and wheat-free foods and people look at you like you have the plague and tell you the typical, “Oh, I could never do that.” People are so in love with their bottled dressings, packaged cookies, 1-lb steaks at every meal that they don’t stop and look at their own health. The “flavor” and “immediate satisfaction” are way more important than the resulting stomachache, 50 pounds they have put on in their mid-section, or worse the disease that is ravaging their body and they don’t even know it. It’s for these reasons that it took me so long to switch over. The constant health issues were what caused us to stop and make the conscious decision that we needed a change. My husband was diagnosed with thyroid cancer. We’re both in our 20s – that isn’t supposed to happen to people in their 20s. I not only had the miscarriage, but also ovarian cysts and kidney stones. My husband took a sensitivity test and the results were that he was sensitive to wheat, casein (common ingredient in dairy products) and cane sugar – three ingredients that are in the majority of the American diet. He had also been struggling with kidney stones and gout, a result of high acid foods. What foods are highly acidic? Meat and dairy – two of our absolute favorite foods. So what resulted was a mostly vegan, mostly grain-free diet. Foreign soil anyone? Our families thought we were crazy, but as soon as we started the change to the “hippie diet” as we like to call it, our health began to improve dramatically. Fortunately our meals are way more than just granola and hemp. Normal people can cook and eat this way – it’s a lot easier than you think it is (and most of the time it tastes better). So the challenge of this guest blog is to cook foods that most people buy pre-packaged and processed. What a better way to do this than making your own salad dressing. I used to think making your own dressing was impossible. Each bottle of dressing tasted perfect (yep, every drop of preservatives, sodium and high fructose corn syrup-laden creamy goodness) – how was it that I could match that? I started trying the so-called healthy dressings. They were disgusting. They tasted fake – either being too sweet, too bitter, or something just wasn’t right. So I took matters into my own hands and worked on many different versions and test recipes. My absolute favorite salad in the world is Caesar salad. Unfortunately real Caesar dressing has anchovies and raw eggs in it – not exactly in the vegan plan. I researched several vegan Caesar dressing recipes and came up with my own. 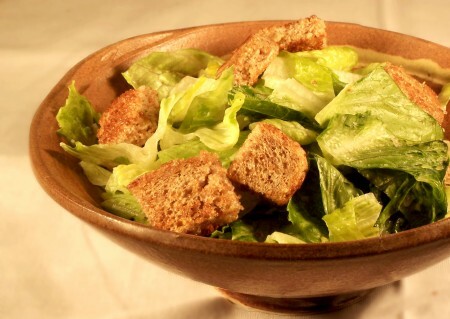 I have tested this on several non-vegans and they agree that this is by far the best Caesar salad they have tasted. Add some homemade croutons and you have an absolute hit. The croutons were another challenge. I loved boxed croutons. But if you look at the ingredients, there are usually 30-50 items listed. I vowed to make croutons that were crunchy and tasted good so that my everyday salads could have added crunch. I usually use Ezekiel bread which is a sprouted grain bread. While this is not a gluten free bread, my husband has been able to tolerate the wheat content in it (the sprouted wheat is at its best form – lowest gluten content and the most nutrition it will ever have). If you have celiac disease and can’t handle gluten in any way, please DO NOT use this bread. Instead use your favorite gluten free bread, it will work just as well since gluten free bread usually toasts extremely nicely. In fact Elana of Elana’s Pantry has developed a wonderful homemade gluten free bread that is extremely tasty – it was so good that my husband and I ate the entire loaf in one setting. I’ll give you a mini tip about my common substitutions. For mayo, I use Grapeseed Oil Vegenaise – a wonderful egg-free, non-GMO (Genetically Modified Organism) mayonnaise. Instead of soy sauce or Worcestershire sauce, I use Bragg Liquid Aminos. My go-to oil is grapeseed oil. It’s a wonderful oil that has a mild butter flavor (so it can be used in place of butter in baking) and can be heated to higher temperatures than olive oil (and doesn’t have the strong olive oil taste). Instead of table salt, I use organic sea salt because the only ingredient is salt – no added chemicals. These great ingredients should be staples in any kitchen. Whisk Vegenaise, garlic, mustard, lemon juice, liquid aminos, sea salt, and oil in a small bowl. Toss with lettuce, making sure to cover the lettuce evenly. Place your slice of bread in the toaster and toast it until its well toasted, but not burned (you want your croutons to be kind of hard, but its up to you how hard you like your croutons). Cut the garlic in half and rub one entire side of the toast with the cut end – this will give your croutons a wonderful garlic flavor. Cut the toast into your desired number of croutons. If this isn’t enough croutons, just make more – its that simple (and tastes way better than boxed croutons you find in the store, plus you just saved yourself $3.50 by making your own). Alternately (or in addition to the previous steps), make your toast and cut into the number of croutons you want. Put 1 Tbsp grapeseed or olive oil in and 1 tsp of your favorite seasoning. Place the croutons in the bag and toss to cover the croutons evenly. My helpful healthful tip on how to snack at work without touching the vending machine: Go to your local grocery store’s bulk bins and fill a bag with one pound of your favorite nut – mine happens to be raw almonds. Put the nuts in an air-tight container. Take your container with you wherever you go. When you get hungry, pull it out and eat a few. This will tide you over until lunchtime, or in the middle of the afternoon when those cravings hit. The crunchiness of the nuts will keep you satisfied and will tide you over until your next meal. The $4 you spend on your snack will help out your appetite and wallet (since you probably won’t eat an entire pound of nuts in one setting), plus you’re getting vital nutrients with your nut of choice. That salad sounds very tasty and refreshing! I love salads however, I love them even more when someone else makes them, ha. I need to try and make my own croutons soon too. Thanks for a great post! Wow, what an incredible story, you have gone through so much! I'm totally with you on the salad dressings, I haven't bought a bottled one in a long time! Food for thought, there's nearly always a silver lining to a grey cloud. Great recipe thanks for sharing. No such thing as vending machines in our part of the world! We don't even have a shop here so food planning is the key. Will buy some nuts I think ! Wow, what a lovely salad dressing. I'm curious though, why the liquid aminos instead of soy sauce? (gluten-free even) Do you avoid soy as well? I actually should try Bragg's. Never have. I see a lot of people swear by it! Alta – we're only gluten free because of the wheat sensitivity. I began having health problems because I'm extremely sensitive to genetically modified soy (which is used in soy sauce most of the time). There are phytoestrogens in them that mimic your own estrogen, which can cause your body to start doing weird things. The ovarian cysts and kidney stones the GMO soy caused weren't worth it. While there is still soy in liquid aminos, it is non-GMO, allowing my body to tolerate it. I too make my own salad dressings – except for Ranch – I haven't figured that one out yet (SF and CF?) and that's one my family's favorites – any thoughts? But I will definitely try the Caesar recipe this weekend. And I love the idea of homemade GF croutons. I will make those as well. The homemade croutons sound great! I love croutons as well but have been avoiding them because of all the ingredients. Will be trying the dressing as well. Haven't found a "healthy" one I like yet. Looking forward to checkingo ut your blog as well. Hugs and prayers for you for the health challenges you've been through. My miscarriage last year was also a catalyst for some major health changes in my life. I have been eating more healthy food since last summer, and at first I felt like I was starving. Kudos to you for figuring out how to enjoy your favorite salad. I haven't followed my diet perfectly, but slowly I have found ways to eat more and more foods that I enjoy. I'm finding myself to be in a large, unspoken group of sisters. Thanks for your encouragement. I'll admit that we haven't been perfect with our diet either, and when we're not, we can tell the difference because we start feeling sick again. It's absolutely amazing how food can affect us the way it does. Grapeseed oil vegenaise – I'll look for it! Thanks! Your story is really inspiring! I'm still very stuck in the 'my friends and family think I'm a crazy hippie' mode. But I'm hoping that, like you did, I'll start to win them over by showing them that there really are tasty ways to cook healthier. A great snack tip! I already carry a baggie with nuts in it, but I hope more and more will too! I have all those ingredients on hand (we use vegenaise, grapeseed oil, and bragg's liquid aminos too)… perhaps I'll make this tonight for my family. They'll love it! thanks!! And I totally agree about salad dressings — the ones I make have incredible flavor. It's always inspiring to see people make such dramatic changes to improve their health and resolve existing problems. Almonds are often my "go to" snack. Almonds, walnuts, pecans, and apples are always with me. Respectfully, I do want to address the Ezekiel bread info. As a gluten intolerance/celiac support group leader, it's important to note that gluten sensitivity can be a misleading term. Gluten sensitivity does not imply as the name suggests, that it's a mild issue and, therefore, one can eat small amounts/low levels of gluten. Many folks will tell you that they believed that was the case and ate that way for years before their symptoms/illnesses ramped up and they finally cut out gluten completely or continued with serious symptoms/issues. As Tom Malterre of Whole Life Nutrition stated to my support group meeting, celiac disease is gluten sensitivity that has progressed to the stage where it meets the criteria for celiac per the gold standard diagnosis (blood test and biopsy). Anyone who has any gluten issues of any kind should NOT be eating gluten in any form. Even when one does not have noticeable symptoms/issues, gluten is harming the body if one has gluten issues. Yes, it can be silent and, in fact, celiac resources say about 40% of those with "gold-standard" celiac have silent celiac. Of course, we all have to make our own judgments, but again for everyone reading, gluten in any form should NOT be consumed if one is gluten sensitive, gluten intolerant, or celiac. It should literally be off the table. Also definitely agree about Braggs – that stuff is amazing! We use it for salad dressing, marinades, in our stir frys…etc and it is a perfect substitute for soy sauce. Thanks again for your inspiration and can't wait to read more tips! This sounds great! I have a GFDF Ranch dressing included in my post (my post was included in the first week in this series) along with Buffalo Tofu, but my dressing includes soymilk. Your recipe sounds like a great alternative. And the croutons – ooh la la! They just make the salad come alive, don't they???!!! Great job! Good to meet you! Thank you Sara! My Mom loves caesar salad but has cut it out since she too is trying to live a healthier lifestyle. So I told her about your post and I will definitely try this to see if it meets her standards 🙂 She always made her own dressing! Just in time for Mother's Day. Gluten-free living is easy and delicious, but it's not something to take lightly. Gluten intolerance is a tricky issue. My son is gluten intolerant and therefore entirely gluten-free. My husband has celiac and I am quite sure my son's gluten intolerance would eventually develop into celiac as well. I appreciate all of the encouragement and how difficult gluten free living is. It has been a challenge to get used to. Thank goodness my husband has not been diagnosed with celiac disease, only a wheat sensitivity – so he can actually have gluten. Its just easier to go gluten free to avoid the wheat. I feel for all of you who have had to completely remove it from your diet as the gluten is in everything – we went through a few weeks of depression when we realized that normal bread, pasta, and other things were out. We're just starting to think about adding more salads to our menu for the summer, so this is great timing. Thanks for the recipe.